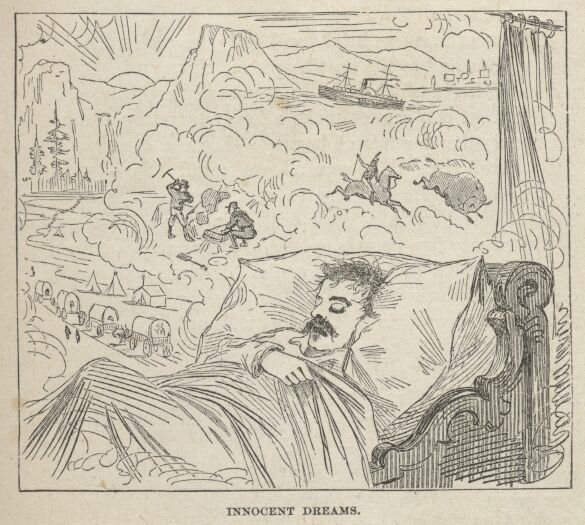 Young Twain Dreaming of his Western Adventures, an early illustration from Roughin’ It. In re-reading another of Mark Twain’s many facetious autobiographies, Roughin’ It (1872), about his experiences as a young man in the Nevada territories, I am reminded of the complexities of humor in literature. Twain is exceptionally funny throughout this narrative — to great political effect. Sure there are occasional streaks of virulent racism, so discomfiting to the modern reader that they detract from my ability to love his humor to the hilt (and the effect can be even more painful to me, reading as a mixed-race person). But there is still reason to read Twain, not least because in reading a book like Roughin’ It we are made painfully aware of social boundaries. As with jokes more generally, the humor of the book deliberately calls attention to thresholds of normalcy, where conventional morality, then as now, crosses over into criminality, where what passes for humdrum morphs into the downright unusual, and where the low become high and vice versa — in a veritable carnivàle of role reversals. There are a number of jokes braided together here (few of them funny at all anymore). One depends upon the sudden fluidity of human and beast. Is this a natural similarity or an unnatural one? Both coyotes and Natives forage. Both have been reduced to foraging. The reason for their reduction could be a source of guilt for Twain’s readers and mine, and so humor works in the good old-fashioned Freudian sense as a kind of pressure valve. In the hydraulics of guilt or shame and the concomitant joy one feels in their release, jokes serve as the adaptive means of palliating the disquiet of our emotional diet. Here, we are induced to laugh at the gustatory resilience of the Native, who like the bestial coyote can subsist on the most dangerous of poisons and toxins. Twain’s Indian has neither vanished nor been vanquished as in other myths of the day, but lingers voraciously. He is unkillable and in fact savors those substances made by Europeans used to destroy large tracts of land in need of settlement. The nitro-glycerine commonly used at the time to clear mountains for railroads is but the Indian’s snack. Laughter here would be commensurate to the alarm or guilt readers may have felt over the violent Indian wars reported in the daily news of the 1860s and 1870s. Who could feel bad about the decimation of Apaches and Navajos if, even for a moment and with the inducement of an “innocent” laugh, we can imagine such humans on a par with desert animals? 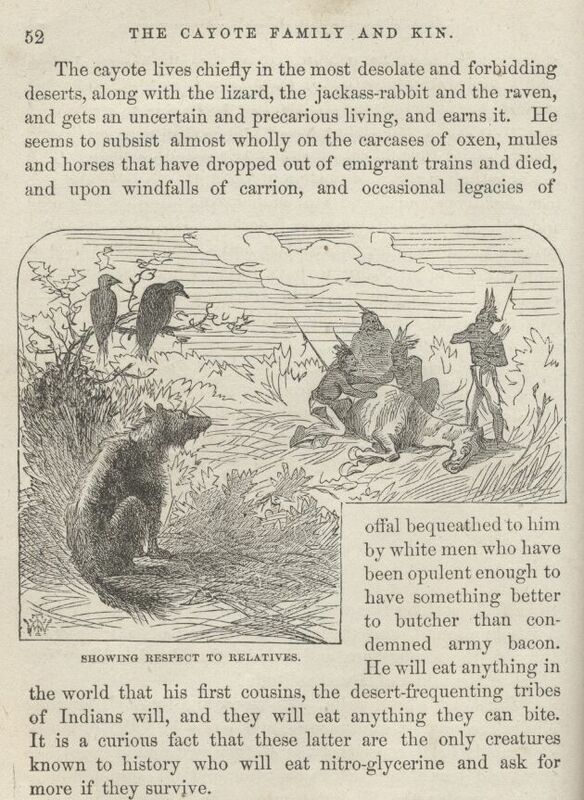 The connection is made all the more curious when we notice that Twain has already approached the coyote as a legal subject in this excerpt, whose rights — civil, legal, territorial — are as absurd to consider as the recourse to legal language when discussing the “inheritance” of the “cayote” would suggest. upon windfalls of carrion, and occasional legacies of offal bequeathed to him by white men who have been opulent enough to have something better to butcher than condemned army bacon. The racism that equates Native Americans to savage coyotes is uncharacteristically overt in Twain’s time, not covered over or pretended away as it often is in ours (as if our efforts to load up Twain as a scape goat for Native American genocide or four hundred years of African slavery could actually succeed sufficiently to re-write history and make us all magically innocent of that history). Erasing Huckelberry Finn from high school reading lists doesn’t make slavery or racism go away. It only banishes our knowledge about them, which is already part of the problem that perpetuates discrimination. Nevertheless, back to my point about the function of humor… There are politics in those inducements to laugh. Usually, the politics follows Freud’s simplified (but not simple) model of the hydraulics of the ego–what we repress builds up with humorous potential until it is released in jokes. And yet, jokes in literary language accomplish much more. This particular reference to the strange eating habits of creatures met during Twain’s adventures is merely one of many. A few pages before this seemingly trivial but explosive passage about the Native’s taste for settlement-clearing biohazards, Twain makes us audience to an experience that is out of temporal sync with the rest of his nostalgic memories of those youthful days out West with his brother. manuscript letters written for the home papers. But he was treading on dangerous ground, now. He began to come across solid wisdom in those documents that was rather weighty on his stomach; and occasionally he would take a joke that would shake him up till it loosened his teeth; it was getting to be perilous times with him, but he held his grip with good courage and hopefully, till at last he began to stumble on statements that not even a camel could swallow with impunity. He began to gag and gasp, and his eyes to stand out, and his forelegs to spread, and in about a quarter of a minute he fell over as stiff as a carpenter’s work-bench, and died a death of indescribable agony. I went and pulled the manuscript out of his mouth, and found that the sensitive creature had choked to death on one of the mildest and gentlest statements of fact that I ever laid before a trusting public. The joke functions as a sort of apologia for later jokes riddled throughout Roughin’ It. And it turns on the implied association between the bold yet self-injurious consumption practices of the exotic animal and the heedless reader of Twain’s funny but sometimes barbed language games. These are only words, his cautionary statement seems to say, consolingly. They are mere words based upon the past so there too they are a type of dreaming and even more ethereal. Let us not eat them too hastily nor choke on them — to death. For if we do, then we shall posthumously join the small bestiary of weird eaters that Twain assembles for us in the opening pages of Roughin’ It, bleating and bovine, absurdly bloated with an explosive significance fit only for a camel, and wishing ourselves to have had the mythical and altogether political constitution of Twain’s imaginary Native. What this apologia wishes for is an exemption from the “novel actuality” that humor theorist Simon Critchley might see in Twain’s humor. And we could no doubt continue. My prediction is that the extra interpretation won’t kill us as so much ingested nitroglycerin, but that it will quell the paroxysms of history, the angina of the past, that reaches through those seemingly very innocent and merely funny passages, whose passing was only ever partial. Of course, to Freud, humor in the sense of a psychological function couldn’t be something one either has or lacks. Society has it and so we do too. Language and communication have places reserved for it, rituals devoted to it, and so we do too. In “Jokes and Their Relation to the Unconscious” (1905), humor has more of a societal function than an individual one. It is reassuring that even totalitarianism was unable to eradicate it try as they may. And the totalitarian state even inadvertently becoming the joke, the thing that must be mocked in order to be resisted. Zizek writes about laughter under totalitarianism. But my favorite meditation on the subject appears as one of the side comments in Kundera’s Unbearable Lightness of Being–about Stalin’s son. I have not read Unbearable Lightness of Being, although there is something familiar about the title. Perhaps someone recommended it before. In any case, your comment intrigued me enough for me to add it to my next book shopping list. Thank you. You won’t be disappointed. Some would rank it among the finest novels ever written. 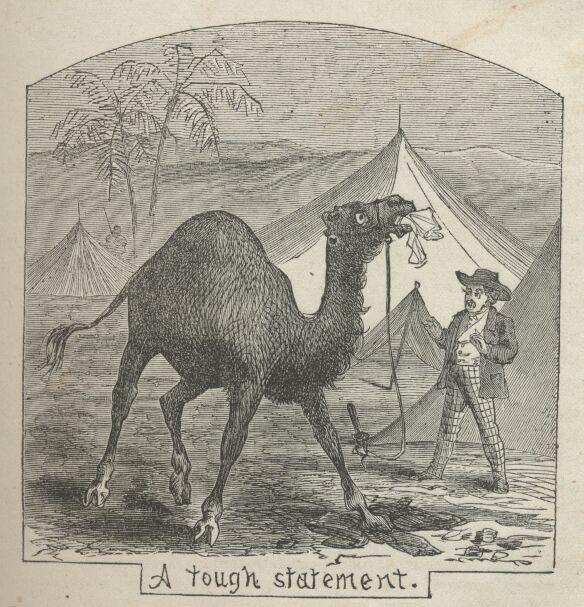 Funny how things haven’t changed much – and yet if we were constantly reminded of the camel, perhaps there would be fewer causes out there against the inane.